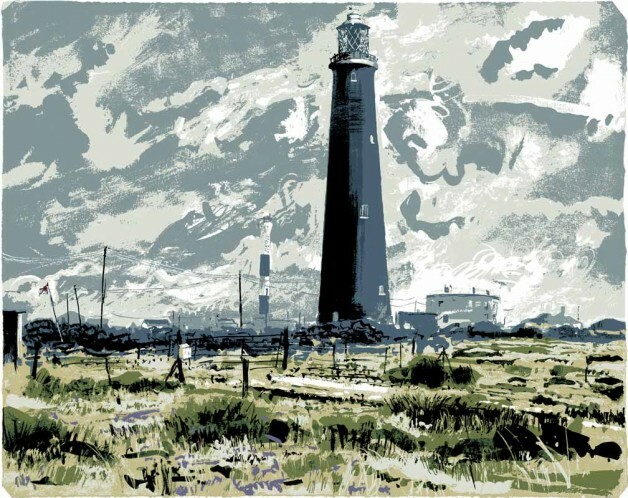 It was a windswept day in March at Dungeness when I did the painting that became this print. As you drive onto the peninsular the atmosphere of the place envelopes you. Scudding clouds overhead, the smell of of the sea, black wooden clapperboard houses and the odd Union Jack all accompanied by the steady vibrating hum eminating from the nuclear power station. And then, of course the 2 lighthouses, the High Light Tower 41 m high built in 1901 and Dungeness Lighthouse built in the 80’s.